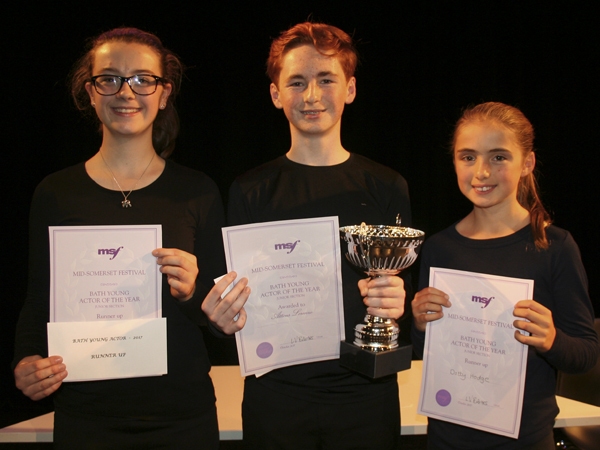 Bath Young Actor of the Year, a highlight of the Mid-Somerset Festival calendar, is now in its fifth year. 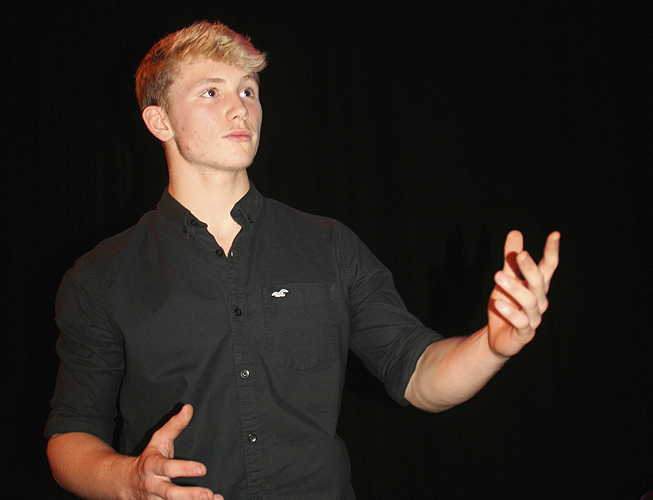 On October 12th six talented performers, chosen from the 2018 festival classes in March, competed for the junior and senior titles at The Edge, the University of Bath’s exciting arts venue. 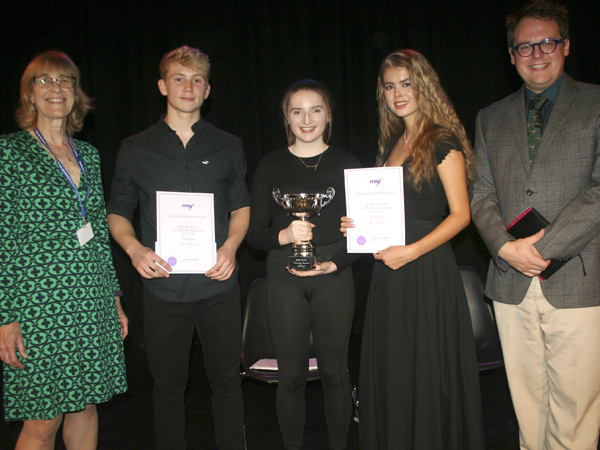 This year’s adjudicators Ben Humphrey and Ann Bauer commented on how the evening was a fantastic celebration of all things theatrical. Joint runners-up in this section were Raphael Gahagan and Milenna Aldam. 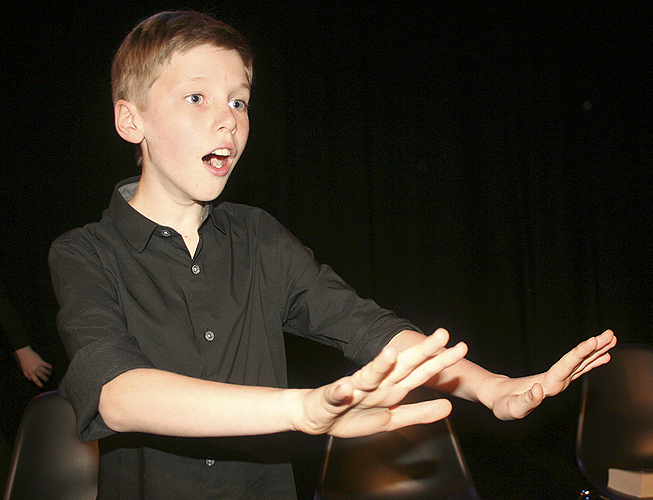 Raphael was commended by Ben for the ‘genuine sense of care’ and his engagement with the audience during the pieces he chose for his theme ‘The Children’s War.’ Adjudicator Ann Bauer complimented Milenna on the sincerity she brought to her performances. 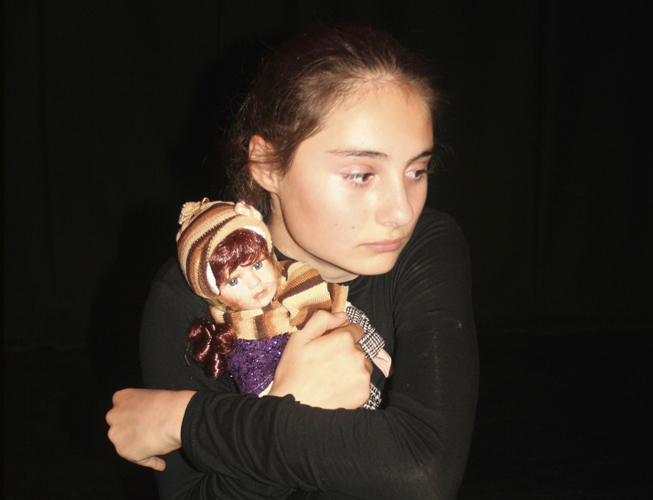 Anabella Fairgrieve’s ‘invisible’ acting and ‘less is more’ performance in ‘Finding Your Voice’ was judged a winner. 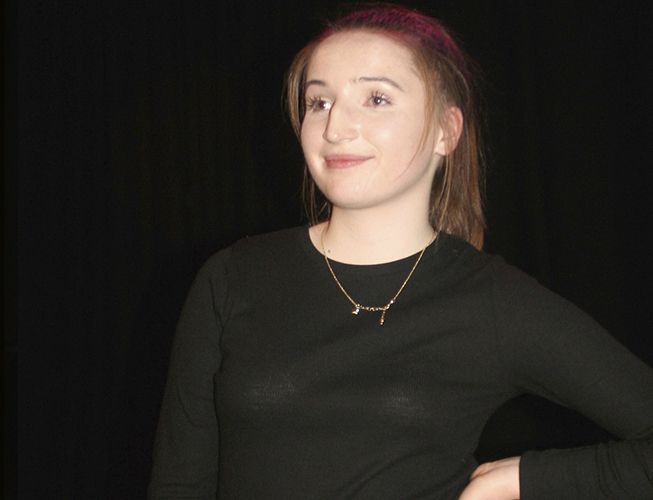 From her powerfully moving portrayal of Rosie in Bovell’s ‘Things I Know to be True’ to her pitch-perfect accent and clever, comic timing in ‘The Help’, she drew us in ‘with a quiet power’, commented Ann Bauer, winning Anabella the senior Bath Actor of the Year cup. 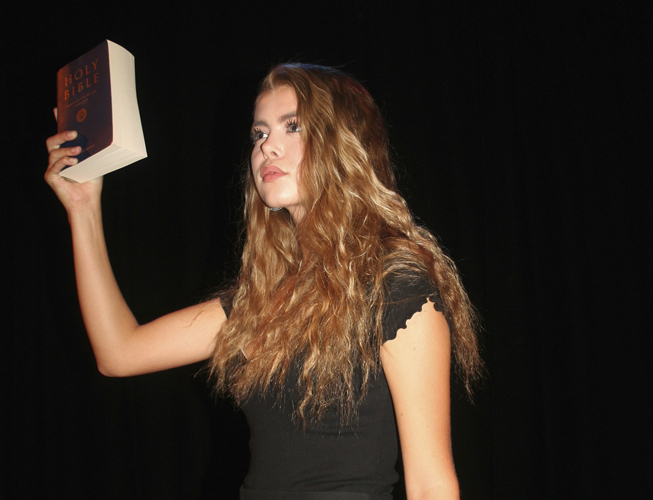 Runner-up Jack Attwood and Alice Robinson explored ‘Ambition’ and ‘Who was Anne Boleyn?’ as their themes. Jack’s command of the stage and ability to play the audience was evident in all his pieces. 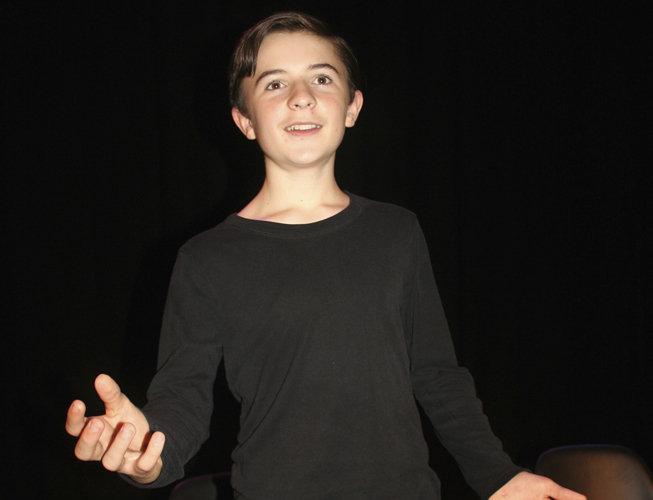 Adjudicator Ben Humphrey admitted he envied the magnificent power in Jack’s strong, resonant voice – causing the audience to laugh. ‘Your eyes told us so much,’ said Anne Bauer to Alice who created a range of moods in her exploration of Henry V111’s second wife. 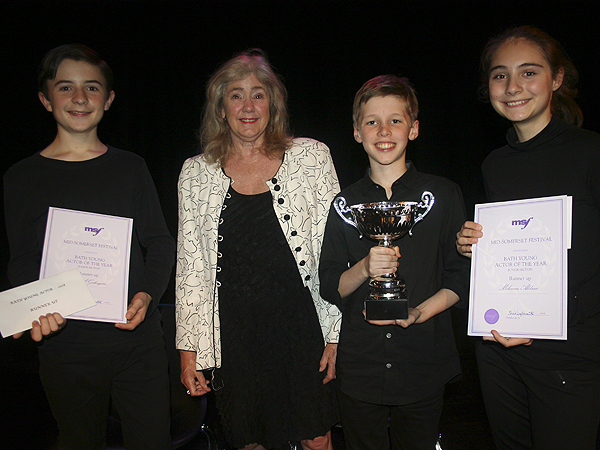 ‘There’s fabulous talent here and wonderful diverse pieces,’ said former Mayor of Bath, Cllr Cherry Beath, as she presented cups, certificates and prize money, sponsored by Kingswood Preparatory School, to the competitors. She added she was proud to be a patron of the Mid-Somerset Festival which is run entirely by volunteers and she encouraged others to become involved. Junior: Raphael Gahagan, Councillor Cherry Beath, Joshua Glover, Milenna Aldam. Senior: Ann Bauer, Jack Attwood, Anabella Faigrieve, Alice Robinson, Ben Humphrey. 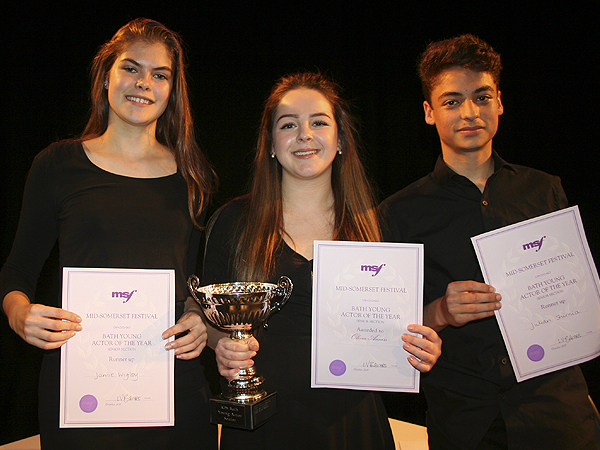 Dotty Hodge, Atticus Lorenzo and Izzy Lane in the Junior category and Jamie Wigley, Julian Shirnia and Olivia Annis in the Senior category were all more than worthy of the trophy. At the end of the evening the adjudicators, Jonathon Owen and Jenny Thornton, chose Atticus as Junior Bath Young Actor for his thoroughly entertaining exploration of the personification of animals in literature, and Olivia as Bath Young Actor for her exceptionally accomplished interpretations of Shakespeare, Dickens and contemporary drama. Guests of honour at the event, sponsored by Kingswood Prep School, included Wera Hobhouse MP and Cherry Beath, Chair of the Council, who both presented the prizes to the winners. Mid Somerset Festival Chair, Lynne Barnes, thanked the families of the young people involved for their support and encouragement. The Mid Somerset Festival would like to thank Kingswood Preparatory School for its continued sponsorship of this event.